After completing your purchase you will receive an email or print letter with instructions on claiming your online access. Biological Psychiatry is one of the most selective and highly cited journals in the field of psychiatric neuroscience. The 2017 Impact Factor score for Biological Psychiatry is 11.982. In the 2017 Journal Citation Reports® published by Clarivate Analytics, it is ranked 6th out of 142 Psychiatry titles and 9th out of 261 Neurosciences titles, by Impact Factor. By total citations, Biological Psychiatry is ranked 1st in Psychiatry. It is also the 1st ranked journal in Psychiatry according to Google Scholar (July 2017). Biological Psychiatry's acceptance rate is less than 10%. The average time from submission to first decision is less than 20 days, with an editorial rejection (reject without peer review) decision issued within 5 days. Accepted articles are published online ahead of print in an average of 35 business days, and articles are published in print 3-6 months after acceptance. 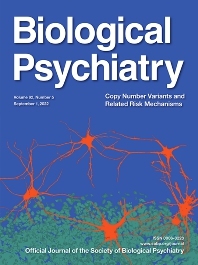 More information about the journal and the Society of Biological Psychiatry is available through links at the top of this page. In addition to offering the finest reports in psychiatric neuroscience today, we hope to bring the journal's information to you in the most user-friendly and easily accessible manner. Therefore, your feedback is welcome at biol.psych@sobp.org. No responsibility is assumed by the Publisher or by the Society of Biological Psychiatry for any injury and/or damages to persons or property as a matter of products liability, negligence or otherwise, or from any use or operation of any methods, products, instructions, or ideas contained in the material herein. No suggested test or procedure should be carried out unless, in the reader's judgment, its risk is justified. Because of rapid advances in the medical sciences, we recommend the independent verification of diagnoses and drug dosages. Discussions, views, and recommendations as to medical procedures, choice of drugs, and drug dosages are the responsibility of the authors.